Grace of pupupiewithbabybear.blogspot.in reviewed Yakimix Podium. She really like the food and the ambiance over Yakimix Podium. Service is prompt and friendly too, and the restaurant itself is definitely elegant and comfortable. Another Review is by Michy of Dekaphobe.com. She first visited Yakimix Podium two years ago with her friends. She loved the food served there in the buffet but also some things she didn’t like. For desserts, I helped myself with scoops of ice cream, buchi, mini cheesecakes, leche flan and other pastries. I’m okay with dessert as long as I have ice cream, but I’ll happily skip the pastries the next time. Gretchen of Filipinaexplorer.com reviewed a branch of Yakimix that is Yakimix Manila. 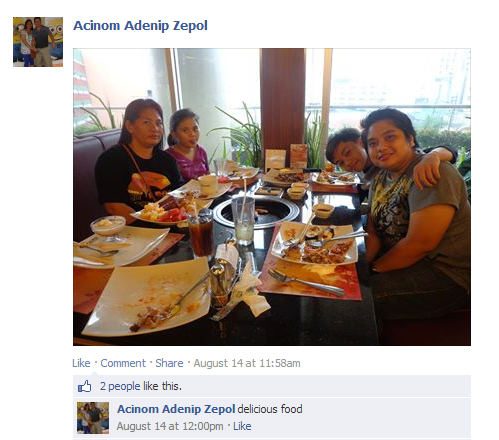 She visited this Yakimix branch; Robinson’s Place Manila in Ermita with her family on her birthday. Her husband loved their lechon macau… also tempura are a must try! For starters, we spooned off some chicken brocolli flower cream soup. Thick, creamy and flavorful, it is a filling and delightful starter to a meal. Other soups are available like crab and corn and sukiyaki for those who like variety. I particularly loved the savory red curry beef, the chicken wing chili pepper, and pork bacon with sauce, which tasted like liempo. Yum! Because they are already pre-seasoned, cooking them over the smokeless grill was so easy, and doesn’t leave you smelling like coal and barbeque. There are a few ala-carte dishes for those who don’t want to grill their own, such as spicy chicken and Japanese style cheese and crabstick ball. The baked brocolli with bacon cheese sauce takes the cake, though. I love, love, love this dish. Jerellt of jerelltabenoja.com was not that satisfied with the food. She visited Yakimix Manila. She found that the there was not much variety in food at the buffet. Moreover, the buffet did not include beverages. I wasn’t able to take photos of the other dishes. The choices were a bit limited, but we specifically enjoyed their Tempura and the baby potatoes! These two saved the day! I also noticed that they only serve one kind of dimsum and only a few kinds of rice rolls. I actually felt robbed considering that most of the food choices were just so-so. I know this may sound like a rant, but we all felt that we didn’t get what we paid for. Another disappointment is the fact that the buffet spread does not include beverages. Customers need to pay an additional amount for their drinks. All Prices at Yakimix are NET (Inclusive of VAT and NO SERVICE CHARGE). Left Over Price, you are charged P699. Bottled Water is available at P30. San Miguel Beer (Light & Pale Pilsen) is also available at P60. There are many different styles of food offered at Yakimix. They provide buffets of Chinese, Filipino, Italian, Japanese and Korean Cuisine. Seafood, Sushi Bars, Pizza and Thai Food are also available. It has also recently launched American Cuisine. Yakimix has really a great variety of food available. I am surely going to try the recently launched American Cuisine at Yakimix. Also, the sushi bars and seafood seems very yummy! The most exciting part about the Yakimix Podium is cooking over their smokeless grill. I have never cooked before over a smokeless grill. It is going to be my first experience. I am surely going to enjoy it. Feeling very excited about my visit !!!! One Response to "Eat All You Can At Yakimix Podium"